One way to organize the great and growing body of research into autism is via a sort-of ‘top-down’ vs. ‘bottom-up’ perspective. From the ‘top-down’ one can read observational research that carefully catalogs the many & varied social and cognitive attributes that are associated with autism. Often times, these behavioral studies are coupled with neurochemical or neuroimaging studies that test whether variation in such biomarkers is correlated with aspects of autism. In this manner, the research aims to dig down into the physiology and biochemistry of the developing brain to find out what is different and what differences might predict the onset of autistic traits. At the deepest biological level – the bedrock, so to speak – are a number of genetic variations that have been correlated with autism. These genetic variants permit another research strategy – a ‘bottom-up’ strategy that allows investigators to ask, “what goes wrong when we manipulate this genetic variant?” While proponents of each strategy are painfully aware of the limitations of their own strategy – oft on the barbed-end of commentary from the other side – it is especially exciting when the ‘top-down’ and ‘bottom-up’ methods find themselves meeting in the agreement in the middle. Well, the results are rather astounding to me. Most amazing is the expression of a small nucleoar RNA (snoRNA) – SNORD115 (mouse-HBII52) – that function in the nucleolus of the cell, and plays a role in the alternative splicing of exon Vb of the 5HT2C receptor. The team then found that the editing of 5HTR2C was altered in the duplication mice and also that Ca++ signalling was increased when the 5HTR2C receptors were stimulated in the duplication mice (compared to controls). Thus, a role for altered serotonin function – which has been a longstanding finding in the ‘topdown’ approach – was met midway and affirmed by this ‘bottom-up’ approach! Also included in the paper are descriptions of the abberant social behaviors of the mice via a 3-chambered social interaction test where duplication mice were rather indifferent to a stranger mouse (wild-type mice often will hang out with each other). 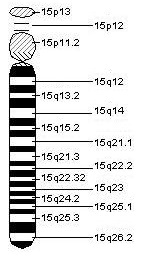 Another twist to the story is the way in which the 15q11-13 region displays a phenomenon known as genomic-imprinting, whereby only the mother or the father’s portion of the chromosome is expressed. For example, the authors show that the mouse duplication is ‘maternally imprinted’ meaning that that pups do not express the copy of the duplication that comes from the mother (its expression is shut down via epigenetic mechanisms that involve – wait for it – snoRNAs!) so the effects that they report are only from mice who obtained the duplication from their fathers. So, if you by chance were wondering why its so tough to sort out the genetic basis of autism – here’s one reason why. On top of this, the 5HTR2C gene is located on the X-chromosome which complicates the story even more in terms of sorting out the inheritance of the disorder. Further weird & wild is the fact that the UBE3A gene (paternally imprinted) and the genetic cause of Angelman Syndrome sits in this region – as does the SNRPN gene (maternally imprinted) which encodes a protein that influences alternative RNA splicing and also gives rise to Prader-Willi syndrome. Thus, this tiny region of the genome, which carries so-called “small” RNAs can influence a multitude of developmental disabilities. Certainly, a region of the genome that merits further study! !